Thank God for the visions and dreams given in the book of Daniel! As part of the #DanielChallenge, this is now our second encounter with the prophetic chapters of Daniel. We saw that in Chapter 6, that the episode of the Lion’s Den was parallel to the scenes leading up to the crucifixion of Jesus (See video for explanation). So there has been a lot of foreshadowing and chronological history in the previous chapters (1-6), now we are getting into the prophesies (7-12). 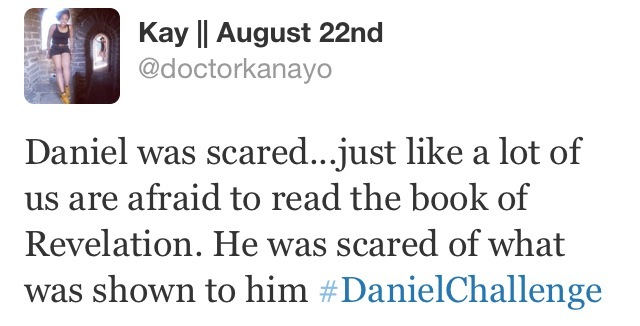 What I loved about chapter 8 is that it showed the humanness yet spiritual nature of Daniel again! Daniel was fearful of the dreams and visions that were shown to him by God (Daniel 8:27), even to the extent that he became ill! I, Daniel, became very weak and was sick for several days after that vision. Then I got up and went back to work for the king, but I was very upset about the vision. I didn’t understand what it meant. Just like many of us are scared of certain dreams that we have or even reading the book of Revelation in the bible which speaks of things to come. I guess his fear was not the ‘worldly’ kind of fear that can paralyse one, but it was the ‘fear of God’, fear of his power, reverence and respect for His sovereign authority. The great thing about Chapter 8 is at the end, despite Daniel being exhausted! In these verses, and in many others, God has revealed the end from the beginning. The vision of the end is astonishing. It can be appalling. But it is also encouraging. God has not only revealed the destruction of the Antichrist but also the victory of His son! And because of this we have hope. We know who wins! We can turn and read the end of the book and be completely assured of the wonderful plan that God has to bring about the return and reign of the King of Kings. Rest assured that God declares the end from the beginning and His word cannot fail. Just make sure that you have made your peace with Him and are on the right side! Not only that, it emphasises how important it is to pray for our nations. Our nation like Israel has fallen away from God. We need more prayers now than ever! It reminds me of my pastor’s preaching last Sunday on Jeremiah 2:11. Has a nation ever exchanged its gods? Our nation, our world has essentially exchanged God for gods…exchanged GLORY for nothing. So it is important to be prayerful! 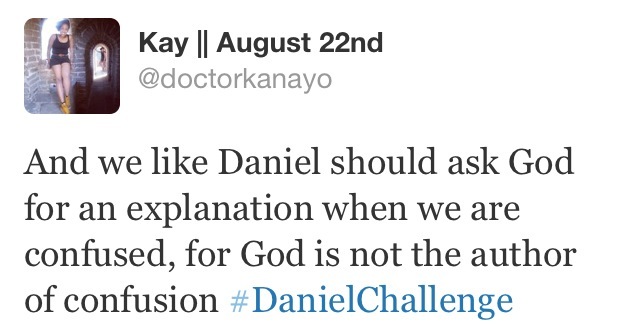 Daniel is very plain when it comes to sin! There isn’t a lot of watering down or blame shifting going on! He is brutally honest about the condition of their current state. Over and over Daniel associates himself with his people Israel. Daniel himself was a righteous man yet he identifies himself with his fellow Jews in this prayer and speaks of their sin as his own. In a sense it gives us a small picture of The One who would one day not only intercede for fallen humanity but would totally identify himself with their sin by taking it upon Himself and destroying it at the cross! ANOTHER PARALLEL AS WE SAW IN CHAPTER 6! How encouraging it must have been for Daniel to hear and know this and how encouraging it is for us to know that the prayers that we pray in accordance to God’s will, have already been answered because of His love for us. This is the faith we have! Daniel’s actions in chapter 9 was an enactment of the scripture in James 5:16! What or who do you compare God’s people to? In chapter 9, what is the measure that Daniel uses to judge where Israel is at? Does he compare them to the Babylonians? Does he compare them to what they were like in previous generations? No, not at all. The only measure that is suitable to use is one that compares their current state with the word of God. The world is gradually sliding away from God’s truth and laws. The church is following behind. There is certainly still a gap in morality between the world and the church so we look at that gap and think everything is okay. And yet all the time the slide continues. Daniel was correct in judging their condition based on what the word of God says, and we should do the same!